Remixing a legacy: Following last year's stunning appearance with her father, Ravi, and their Festival of India tour, Anoushka Shankar is returning to Santa Cruz for a more experimental date at the Rio Theatre. 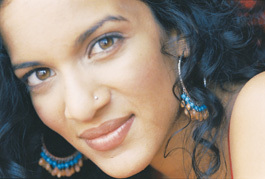 Anoushka Shankar carries a heavy legacy, but she does so with admirable grace and playful wit. As the daughter and star pupil of Indian sitar master Ravi Shankar, Anoushka has become the standard bearer for Indian classical music, the most high-profile exponent of that ancient and rich musical tradition. But she is also a 21st-century woman, with up-to-the-minute musical tastes, a profound sense of social commitment and a truly global perspective. While Anoushka's half-sister Norah Jones has conquered the pop charts, Anoushka has been forging a vital link between the musical idioms of India and the West, a cultural exchange with far reaching implications for many genres. Perhaps this was an inevitable role for someone who grew up in London, New Delhi and Encinitas, Calif., south of Los Angeles. Early on, Anoushka learned traditional Indian songs and dances from her mother, Sukanya. But at age 9 she buckled down to the serious work of mastering the sitar and India's complex musical system of ragas and talas, guided by her illustrious father. Anoushka made her concert debut at age 13 and has since distinguished herself as a masterful and distinctive stylist on sitar. After releasing three highly acclaimed albums of Indian classical music, Anoushka struck out in a bold new direction on her 2005 album Rise, a compelling, often highly percussive fusion of traditional Indian sounds, flamenco flourishes and deep electronic textures. The album features Anoushka's outstanding playing not only on sitar but on keyboards as well. Tracks from Rise have become dance floor favorites, as remixed by DJs like Thievery Corporation and Karsh Kale. Several of these reworkings were released on 2006's Rise Remixed. "In a classical vein," says Anoushka, "I still feel so much like I'm at the beginning of the road, just beginning to know all the deeper aspects of our music. But outside of that, as a composer and performer, is where I feel like there's more freedom. I'm so much about the music being in the moment and being fun as well. If I'm up onstage, I'm enjoying." A year after her appearance with Ravi Shankar at the Civic, Santa Cruz will have a chance to share in the enjoyment when Anoushka brings her own multicultural ensemble to the Rio Theatre on March 31. The group combines traditional Indian and contemporary Western instruments, wielded by some of the the best players on two continents. Emblematically, the rhythm section features Indian tabla virtuoso Tanmoy Bose, and also American musician Jesse Charnow on the drumkit. Both musicians contributed to Rise. "I've been playing with Tanmoy ever since I was 16," Anoushka laughs. "And Jesse and I actually went to high school together. Several years ago he started learning Indian music from my father. That's how we reconnected out of school. He's been part of the band since last summer or so. We're predominantly playing material from Rise, although it has evolved a lot. So although it's based on Rise, it's definitely very improvised and adapted to the group that I've got with me." Even in her cross-cultural musical explorations, Anoushka is continuing in the footsteps of her father, who is notable for his collaborations with Western musicians including Yehudi Menuhin, Andre Previn and of course George Harrison. Anoushka herself worked with the late Beatles guitarist on 1997's Chants of India album, and conducted the 22-piece Indian and Western orchestra at 2002's moving Concert for George shortly after Harrison's passing. Formerly the homecoming queen of her California high school, Anoushka has gone on to share concert stages with everyone from Madonna to Zubin Mehta. And on March 31 she brings her adventurous music to Santa Cruz. METRO SANTA CRUZ: Growing up, you came to the sitar somewhat reluctantly at first? ANOUSHKA SHANKAR: I did. It was definitely different from the way I came to play the piano. That was my own curiosity. I felt an active interest in piano and wanted to play. It was a different kind of thing with sitar. As far back as I can remember, I loved music and I loved to hear my father play. But the sitar was something that seemed to mean more. It wasn't casual. As I kid, I couldn't just pick it up and play. It seemed to entail a commitment. I was lucky that my parents gave me room to decide. They didn't make me feel like I had to play. They were very careful to point out that I should only play if I wanted to--if it made me happy. But at the same time they made it clear, "If you do want to play, this is a musical style that requires a certain amount of dedication and focus." I spoke with your father recently and he told me that, because the family traveled so much, he wasn't able to teach you in the way he was taught--in an isolated village, completely absorbed in the music 24 hours a day with the teacher as a guru. I find it hard to think of any people who learn in that way anymore, simply because it's a different time. Also he was a touring musician and I was on the road with him. So it was definitely a very different life. He was very careful to retain the substance of what he was teaching, but adapting it to today. I would say it was probably harder for him than it was for me, because he was the one who was having to do the adapting. I was on the lucky receiving end of that. Did your training in Indian classical music also include instruction in the spiritual traditions that are so closely bound up with the music? Yes, they are definitely, intricately intertwined. But spirituality wasn't just coming to me through music. Also, culturally speaking, my mom was so amazing in that way, relating mythology, stories, history and religion--all of that was coming to me in such a rich way. What the music does is create even more of a link. For me, the music just solidified everything that I came from and that I was. We lived partly in India and partly in the West as well. So music became the way that I was still partly connected to India even when I was outside of India. Is it possible, do you think, for Westerners to really understand Indian classical music without some understanding of the spirituality behind it, and indeed the whole cultural background? At the end of the day, because it is music, I would say it's possible. But not necessarily to the same extent that you could appreciate it if you went to India. I don't like for Western listeners to become intimidated by a style like Indian classical music. It can be good fun and exciting just to listen to, as all music should be. But if you choose to go deeper, it has so much more to offer. So when you do start to open up to that side of it is when you can really get the true magic. As a soloist on sitar, you've developed a style and sensibility that's quite distinct from your father's. Some of your playing on the 'Anourag' album  almost reminds me of John Coltrane. Well, it's adventurous in that way. There's that sense of the player almost wanting to leap outside the formal structure of the music. That's interesting. It's nice to hear. Are you taking influences from things like jazz? I take influences from various sources. That's something that's only happened consciously more recently. Because, before then, so much grooming was happening through my father. As far as technique, and all that goes, it was all coming from him. And it's been a very natural progression in recent years, where I've become more creative. As a result my playing has become freer and my personality has been coming through when I play. There's always fire, passion and heart in the music itself that inspires me more than anything. But certain approaches that other musicians have are also important. Maybe it's a looseness, for example, in someone's technique. They might be showing a lot of skill, but the way they're doing it is very fluid, and that's an important reminder to me not to get too bound up in technique. Or from New Age or world styles of music, I might hear simplicity. And that's always really important for me. Because I tend to get caught up in the complexities of the music. There is so much theory in Indian classical music. A lot of rules. Exactly, and when you learn that, you do tend to get caught up in it. I don't want to downplay the importance of the rules and structures at all, but it's very easy not to even realize when you've gotten caught up in them. And I want to be able to laugh and enjoy the music and the musicians who are with me. And people really connect with that. That's something that people will tell me about a lot. Growing Up in Public: The daughter of Ravi Shankar can no longer measure her height on the frets of a sitar. As far as contemporary Western music goes, what's influential for you? What are you listening to these days? I love that Gnarls Barkley song "Crazy" that was out last year -- amazing chord changes and melody. When I'm listening to mainstream music, it's still more of the '90s and what's eclectic--Massive Attack and Björk. That's the stuff I go back to. Among newer music, I'm listening more to ambient electronica and hip-hop. I was going to ask what your take is on musicians, like Talvin Singh for instance, who are mixing traditional Indian music with electronica. There are definitely musicians who can be singled out for doing it very well. But there's a large amount of people who aren't doing it so well. There's a lot of that kind of music around these days, especially in India. They've latched onto the fact that that's been happening, so everyone's doing it in their own different way. And people like Talvin Singh, Medieval Pandits, Karsh Kale ... those are the ones I'd single out for having done things in a new way and with great success on both fronts, whether it's production and programming, the Western side of things or the Indian side. That, for me, is the key; what I look for. Because a lot of times I hear people coming from both those sides and one or the other will be lacking. Then, for me, it's hard to listen. Because you hear that lack if you come from both worlds. Making Rise, that's something I was trying to be very careful about. Whatever I ended up using, I didn't want it to be of lesser quality to a person who knows that particular music. What was the impetus behind your direction on 'Rise' that made you move beyond a strictly classical context? It was just wanting to use music that I love. Like you were saying, I wanted to see what I could come up with if I wasn't working within boundaries. That was my main goal. I didn't necessarily have an outcome in mind. But I definitely had a few key desires, which were to incorporate electronic soundscapes and the opportunities that are afforded by them. And to work with a little bit of flamenco; that was definitely something I wanted to go for. And to create something very deep, dark and sort of heavy. That's one of the musical styles that has always inspired me a lot, perhaps more in life than in music. Just that fire, that passion, the unabashedness of it. The culture of Spain has always been magical to me. And my father actually did a project with Yehudi Menuhin in 1995 called From the Sitar to the Guitar. They just released it on DVD recently. It was a concert held in Belgium that traced the journey of the Gypsies all the way from India to Spain. So they had performances by Gypsies from India, Romania, Yugoslavia and eventually Spain. Ever since then it's been in my head that, musically, there is a connection between India and Spain. It is something I am curious about. Is there a gender barrier in Indian classical music? I have to say, if there is, I haven't really come across it. Every time I answer that question, I'm almost surprised to say that I haven't. You might expect that to be the case, but it really isn't. I think it's just more situational that there are less female performers. Because in any traditional context, the woman is the one who's at home, having children and so on. The men are generally the ones working. And when you put that in a touring context, it's more magnified. So while women in India are very likely to learn arts, they are less likely to end up being performers and musicians. Singing is the obvious exception, because there is the need for a female voice. There are definitely women here and there who are performing Indian classical music. And I've never come across any bias, discouragement or anything like that for being female. How did you first get involved with animal rights? It was a few years ago that I did my first photo shoot with PETA. I've always loved animals. And in India, where there are street animals and whatnot, people aren't as aware of the mistreatment of animals that goes on. I definitely felt like it was a place where I'm more high profile as well. If I say something, it can be heard. So I decided to get involved. I love their organization. They do so much great work in India. I will continue to do things with them whenever I go there. And you've been involved in AIDS related causes as well. Yes. But the thing I'm most excited about right now is that I just signed up this winter with the United Nations World Food Program, as their first spokesperson in India. I'm hoping that will be a long term association. I'm very deeply happy about being able to do that. Do you think musicians today have the power to influence people's thinking about social issues? There is no question. Especially when you think of the youth around the world. Young people idolize musicians, the people who give them that soundtrack for their lives. If you think of the teenagers, if something moves them, it becomes an emblem. So I think there's no question that musicians have that ability. Musically what's next for you? Are you planning a new album? Yes, I am working on a new album, actually. I'm hoping to release it later in the fall. It's a collaborative project with some interesting guest artists that will push more in the crossover direction I've been in. So I'm also very eager, soon after that, to get back and do more of a classical record and a classical tour again. And in the fall, I'm going to do an acoustic tour of more of my own compositions, moving towards experimentation with Indian music itself, combining north Indian and south Indian and so on. Long-term, I'm trying to balance the classical world with more of the experimental side. Let's hope I can do that. 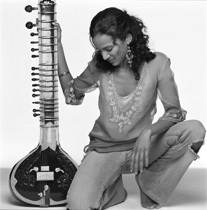 Anoushka Shankar performs Saturday, March 31, at the Rio Theatre, 1205 Soquel Ave., Santa Cruz. Tickets $25, available at Streetlight Records, 831.421.9200, and Ticketweb.com.